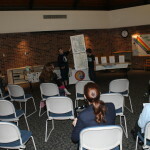 Education: Eastport Public Library, Cory Talbott – Chesapeake Chapter U.S.L.H.S. 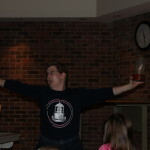 Anne Arundel County Public Libraries generated Lighthouse excitement during their Winter Saturday Kids’ Programs. On January 25, the Deale Library hosted the Chesapeake Chapter for “A Spotlight on Lighthouses”. 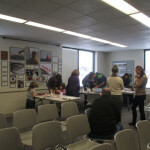 Despite the blustery winter day, a hardy crowd of several children with Moms and Dads in tow attended the program. 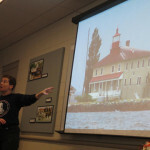 I presented a slideshow highlighting the unique styles of lighthouses on the Chesapeake Bay. 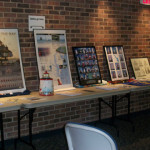 My husband Karl Talbott provided statistical answers for some of our more challenging questions, and my children Claudia and Val Talbott provided both lighthouse trivia and assistance with the Lighthouse Crafts. 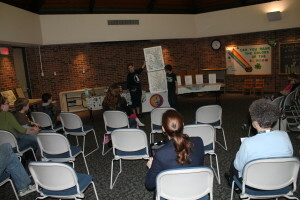 The children who participated asked incredibly astute questions, and clearly knew their stuff! One current Coastie brought his daughter so that they could learn more about such an important part of his career’s history. A ship captain’s wife gave us insight on the requirement that still exists for the captains to memorize the lights and flashes of each lighthouse on the Bay. And we can’t say enough for our wonderful hostess, librarian Rose Jacobius, whose own paper cup model lighthouse was a beautiful replica of her favorite light, Assateague. On March 22, my son Val and I enjoyed a similarly-sized crowd at the Eastport-Annapolis Neck Library, with special audience attendee, our own Loft Keeper, Kyle Roberts. We were unable to use the projector at the last minute, but like any good keeper we simply moved to plan B, and used the models and posters to talk about the unique features of our Bay Lights. 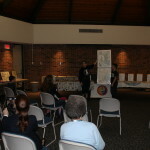 Val provided trivia tidbits on the individual lights highlighting the various architectural styles, and provided expertise on the Lighthouse Crafts, including bringing his duct tape tower models to highlight another craft option. The enthusiastic kids built fabulous paper cup lighthouses incorporating stories from the presentation into their models. One exceptional model included a green pig because some keepers kept farm animals, and our pint-sized architect even had a stair count of how far the oil had to be carried in order to refill the lamps! Building Lighthouses in Deale, MD. 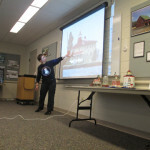 Historian Cory Talbott discussing integral lighthouses in Deale, MD. Historian Cory Talbott pointing out features of Point Lookout Lighthouse. 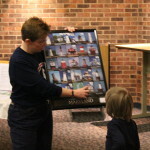 Historian Cory Talbott getting answers from a young lighthouse enthusiast at the Eastport Library in Annapolis, MD. 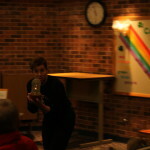 Historian Cory Talbott demonstrates the width of a First Order Fresnel Lens. 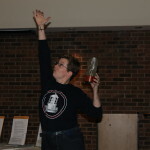 Historian Cory Talbott demonstrates the height if a First Order Fresnel lens. 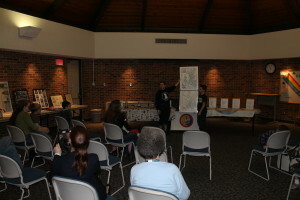 Cory and Val Talbott show the full length of the Chesapeake League.